In a surprise move, Sen. Dianne Feinstein (D-CA) released the transcript Tuesday of the closed-door interview that Glenn Simpson, the founder of the private intelligence firm that assembled the so-called Trump-Russia dossier, gave to the Senate Judiciary Committee in August. The growing focus on the firm Fusion GPS by the Republicans on the committees investigating Russian meddling in the election has become a flashpoint. Republicans have resisted publishing the transcript, despite the firm’s call for it to be released. Feinstein’s move to release it Tuesday was done without the consultation of the committee’s chair, Sen. Chuck Grassley (R-IA), his spokesman said. “The innuendo and misinformation circulating about the transcript are part of a deeply troubling effort to undermine the investigation into potential collusion and obstruction of justice. The only way to set the record straight is to make the transcript public,” she said. Fusion GPS and Grassley had been engaged in a public battle over whether to release it, with Grassley instead calling upon Fusion GPS to participate in an open hearing. Additionally, Grassley last week sent a letter to the Justice Department recommending that Christopher Steele, the ex-British spy Fusion GPS hired to write the dossier, be investigated for criminal charges. We’re currently scouring the 300-page transcript and will be updating with additional details as we go. In the Republican Judiciary staff’s first round of questioning, they focused in on Fusion GPS’ work for in the Prevezon case, a financial crimes case the Justice Department brought against the Russian firm Prevezon Holdings. Fusion GPS worked for the law firm hired by Prevezon. Simpson told the Senate investigators that from the beginning of the projection, Trump’s relationship with Felix Sater, a Russian-born business associate of Trump’s, jumped out at him. 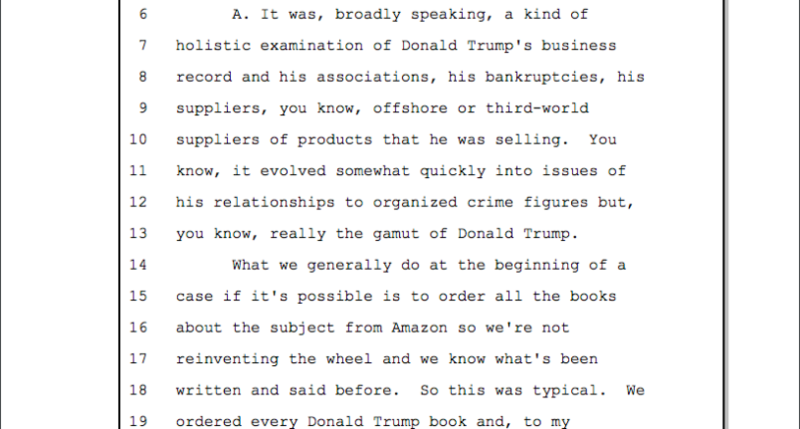 Nonetheless, Fusion GPS dug into other aspects of Trump’s background as well, Simpson said, including his golf courses in Scotland and how his family’s merchandise was being manufactured.